Organic pomegranate seeds are delicious, refreshing snack! This slightly peculiar fruit has been thought to hold legendary powers for centuries.Persians believe Eve actually ate a pomegranate when she plucked from the tree of knowledge in the Garden of Eden, not an apple. This fruit is also featured in mythology and tradition as a symbol of good things. The health benefits of pomegranate are numerous and remarkable. This wonderful fruit offers a wide-range of proven benefits for healing and overall wellness. The core of the rounded fruit is a real treasure of small, juicy and delicious reddish bags in whose interior has seeds. They are the part of the fruit that is eaten. The fruit has an exceptionally low level of saturated fat, cholesterol and sodium on the one hand and a high percentage of fiber on the other. It is rich with folic acid, Vitamin C and Vitamin K. Most common are iron, calcium, copper, potassium and phosphorus from the minerals. Pomegranate is one of the so-called types of super foods. Numerous studies show that it has higher levels of antioxidants than red wine, grape juice and green tea. Antioxidants neutralize the harmful effect of free radicals on cells and thus slow down the aging process and the processes of occurrence of various diseases. Slows the spread of breast cancer. Slows the process of atherosclerosis and reduce the risk of heart disease and blood vessels. Simplified – pomegranate is a super food for the heart. Slows the growth of prostate and breast cancer. Reduce the risk of osteoarthritis and rheumatoid arthritis. Promotes Heart Health – Regular intake of pomegranate juice can maintain good flow of the blood in the body. Because of this property, it subsequently decreases the risk of heart attacks and strokes. The antioxidant components that are contained in this fruit help to keep the bad cholesterol from gaining any significant presence and thus keeps the arteries clear of any clots. The clots are clear because pomegranates have the ability to make the blood thinner. Aids Digestion – Pomegranate juice helps in the smooth functioning of the stomach, heart and liver. This juice induces hunger and can even control thirst. Therefore it is a great choice of drink during summers. It also soothes urinary tract infection and eases the flow of urine. The high amount of dietary fiber, both soluble and insoluble in pomegranate juice helps to improve digestion and regulate bowel movement. Since it has no saturated fats or cholesterol, it is highly recommended for those aiming to lose weight. Prevents Anaemia – Anaemia is a condition caused by the deficiency of red blood cells in the body. Since pomegranate seeds contain ample amount of iron it helps in surmounting the red blood cell deficiency in the body. Mixing some candied sugar in pomegranate juice and introducing a couple of drops in the nostrils is a quick fix to control nose bleeds. It is an excellent remedy for red or sore eyes and falling eye lashes. Prevents Cancer – Pomegranates contain high levels of antioxidants called flavonoids. These flavonoids are known to be effective in counteracting various cancer radials. People that face high risk of prostate and breast cancer should start drinking the juice of this fruit, as it will help them to reduce the risk of developing cancer. Regular consumption of pomegranates can reduce the PSA levels in the body and aid in the fight against existing cancer cells in the body. Boosts Immunity – Pomegranate has strong anti-bacterial and anti-microbial properties which help fight viruses and bacteria and boost our immunity system. It significantly reduces microbes that are found in the mouth commonly responsible for cavities and staph infections. Its anti-microbial properties make it an inhibitor of HIV transmission. Out of all the fruits, pomegranate has the highest potential to inhibit the transmission of HIV. 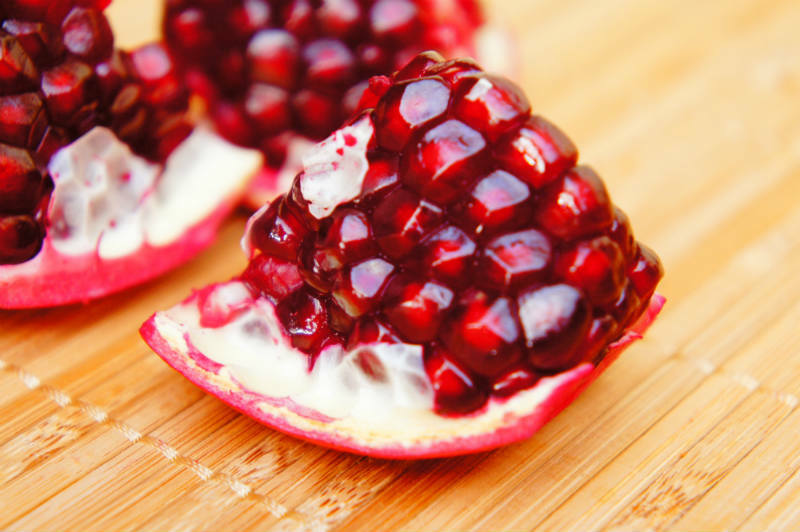 Prevents Osteoarthritis – Pomegranates help reduce illnesses of many forms, including atherosclerosis and osteoarthritis. The damages that are caused due to the thickening and hardening of the arterial walls and in the cartilage and joints can be cured by eating this fruit. Also, pomegranates are capable of preventing the creation of enzymes that are responsible for breaking down connective tissues within the body. Modern medicine gives the pomegranate juice (pure, unsweetened pomegranate juice) honorary first place for healthiest fruit juice.